We're looking at the different stories coming out of Fiat Chrysler and General Motors. 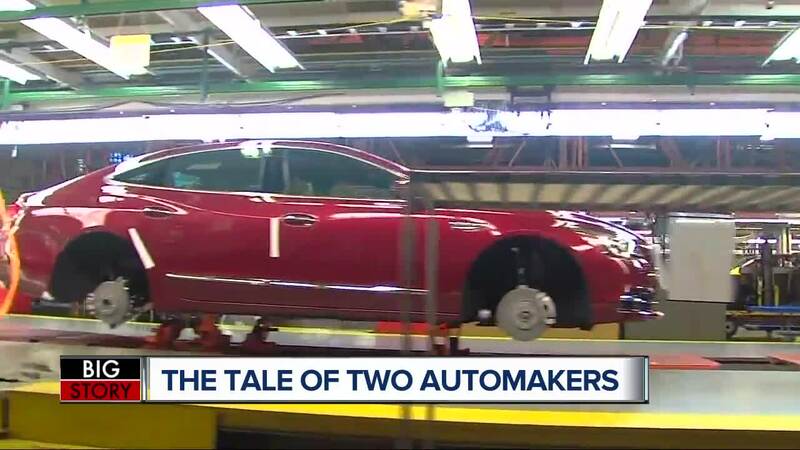 DETROIT (WXYZ) — Two major automakers are making headlines in Detroit for very different reasons. On Tuesday Fiat-Chrysler announced the biggest investment in Detroit an automaker has made in recent history. It came as the UAW announced it is suing General Motors for announcing it plans to close the Warren Transmission plant. The lawsuit alleges General Motors is eliminating jobs that are promised under a contract. “If you look 10 to 15 years ago, Chrysler was not doing well. I think this is a combination of the hard work of UAW workers. They came to the table with management and really changed the companies around,” said UAW Vice President Cindy Estrada. Estrada currently works with Fiat Chrysler, but used to work on negotiations with General Motors. WXYZ asked her for her take on the lawsuit filed. She said she could not comment on the lawsuit, but said General Motors should be doing what Fiat Chrysler is doing: investing in successful plants. So what does General Motors have to say about this lawsuit? “The announcements made by General Motors on November 26 do not violate the provisions of the UAW-GM National Agreement. We continue to work with the UAW on solutions to our business challenges. We have no further comments at this time on the lawsuit filed by the UAW,” said Dan Flores, GM spokesman, in a statement.